Happy Friday!! And a happy Friday it is, because it's the start of Nordstrom's Anniversary Sale! 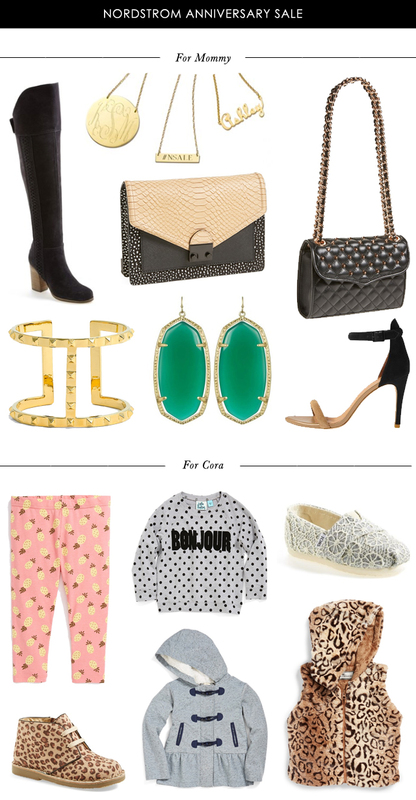 Here are a few of my favorite items right now, and you know I couldn't leave out Cora from such a fabulous sale. There are so many items right now, so act fast before prices go back up on August 9th. I've picked out some basic staples that should be in every woman's wardrobe. Over the knee boots for Fall/Winter, a great little shoulder clutch, and you can't go wrong with those Joie Roxie sandals. I've already got a Moon and Lola monogram pendant with Cora's initials, but I would love to get my initials, hint hint. And for Cora, I really couldn't resist the fun prints that this sale is offering. I mean, can we just talk about how cute those pineapple leggings are? And that Bonjour sweatshirt with polka dots - it's exactly the kind of sweatshirt a little toddler girl should wear. Or at least that's how I feel. Happy shopping and happy weekend everyone! !